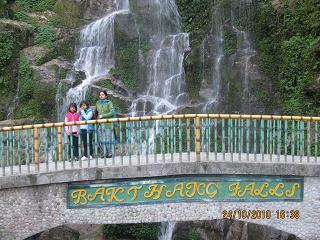 This is the second time holiday trip of our family to Gangtok – a small and beautifully decorated hill town in Sikkim. 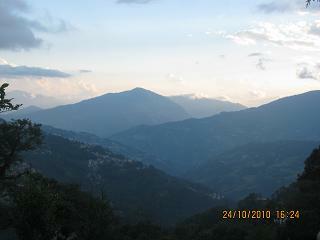 We reached Gangtok on 23rd October 2010 after a six hours of cab journey along the National Highway 31A connecting Gangtok with Siliguri . We checked in Hotel Orchid at Lall Bazar Area. We got a very good room with full views of Kanchenjunga and others snow covered peaks. After a brief rest, we asked the tourist counter of our hotel for making necessary arrangement for sightseeing around Gangtok. (For the tourists looking for sightseeing information in Gangtok , please note that there are three major packages for site seeing . You can check with the hotel you check in or from local travel agents. The Charges for 7 points packages varies from INR 800 in off peak season to INR 1500 during a peak season for a Maruti van (4 seats). If you like to go for 10 points site seeing, then average changes in INR 1200 to INR 1800 during peak season . If you are with family, better you can book from hotel as they take care all issues of car booking , pick and drops etc) . 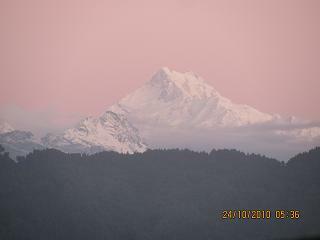 Our sightseeing started with the Darsan of Kanchenjunga at 5:15AM from our Hotel room. Our hotel manager informed earlier that we could see the clear view of Kanchenjunga from our room. So we woke up around 5AM. Around 5:15 Am we could see the view of Kanchenjunga, but it was not clear because of darkness .At around 5:30 AM we could the awesome view of Kanchenjunga and this time it was clear. The first rays of sun fall on the peak, created the riots of colour at Kanchenjunga peak. 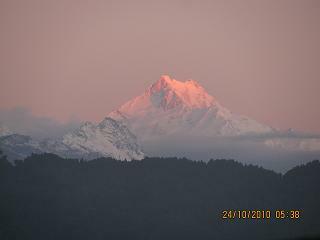 We stood agape there to see the changes of colors of Kanchenjunga peak along with sun rise. This was really a unique experience to see the views from hotel room .Thanks to clear sky and favor of Kanchenjunga for such a splendid view. 1. Rumtek Monastery: This is most famous monastery in Gangtok , it is 24 Km away from the City of Gangtok .The Scenic beauties are awesome . You can see small falls , verdant hills , paddy fields across nested in the valley , and villages alongside during the journey. We have seen the beautiful sculpture and dresses, masks and lots of Books inside the monastery. On the backside of the monastery, we have seen Golden Stupa . We climbed up the stairs to see the beautiful Rumtek Village and snow covered hills at one side and on the side you can have full view of monastery. We have taken special lemon tea from nearby tea stall and started for our next destination. This is really a good place to feel the spiritual aura of Buddhism. Nice place to spend an hour here. 2. Ban Jhraki Waterfalls – This is newly created park for tourists. This is Very good and safe place for close watching of the fall. You can wear the traditions dress and take photos in front of the falls. If you are adventurous, you can relish the taste of mini rope trekking .There is a small park inside for children rides. 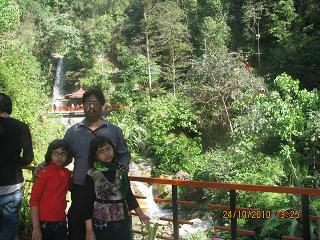 My kids Ankita and Richita enjoyed a lot at this place, running across the uphill toward fall. We went very close to the fall, as this place is very safe. After spending an hour near fall, we climbed down to nearly Food court inside the park. We finished our lunch here with Gangtok special Momo and chowmins . 3. 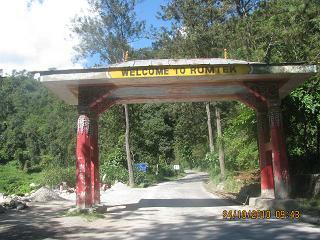 Flower Exhibition center – After spending our first few hours at Rumtek and Ban Jhakri Fall , we started for Flower Exhibition Center . 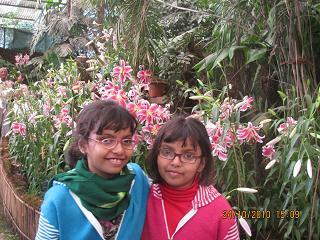 My wife Tanusree, daughters Ankita, Richita all were eagerly waiting for this flower show. 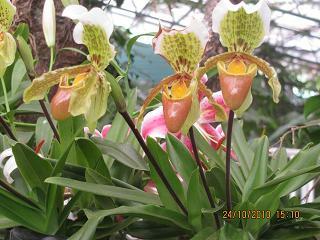 This special orchid show centre located just next to White Memorials halls in Gangtok Town. As we entered the den of orchid flowers, our daughters were running here and there to get the best feels of flowers and air filled fragrance . The flowers show is really awesome. We have seen many varieties of orchids. We have taken snaps of many flowers and spend a quality time inside .It is a different world together, the freshness of the flowers made us fresh. So with fully refreshed minds, we came out for the center for the next spot. 4. Ganesh Tok : Beautiful Ganesh temple located at 6100 ft height and this is the best place to see the Ariel view of Gangtok . Serenity of Ganesh Temple made us fresh again. 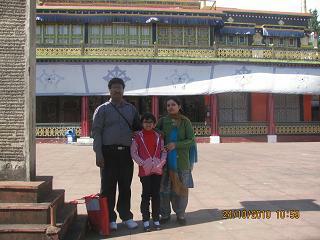 We sit on the temple floor and saw the distant views of Gangtok town , TV towers , Rumtek Monastery . It was already afternoon .We climbed down the stairs of the temple and at the gate of ganesh Tok , we took evening snacks . Then we moved to next spot. 5. 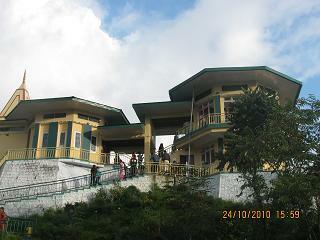 Tashi View point: It very close to Ganesh Tok. So we immediately reached the spot. We climbed a bit up to reach the view point. Form here we could see the mountain range and snow covered mountain peaks. But our luck was not good; all peaks were covered with clouds. 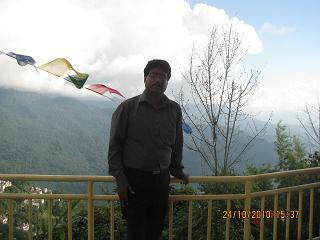 From Tashi view point we could see the splendid views of Gangtok and other nearby places. It was around 4PM afternoon .After spending few minutes, we moved to our next spot Bakthang Fall. 6. Bakthank Fall: We reached the spots around 5PM .We could see the last rays of sun for the day. This a beautiful place to spend an hour, breathe the fresh airs, and feel the freshness of falls and chatting of current along the fall. We halted some time here for evening for tea at nearby tea stall and by that time sun set in behind the distant hills .We slowly started for our hotel. Whole day we managed to visits only six places instead of ten spots, but we always made sure we spent a quality time at each spot. Hurriedness may kills the pace of travel and joy .We enjoyed a lots in our whole day trip and enjoyed every site in Gangtok . Our driver was very co operative, friendly and he nicely explained the area , its brief history . 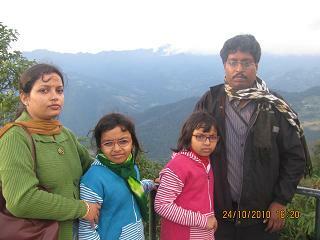 Our daughters take photo with our driver who has really helped us to enjoy the day for site seeing in Gangtok . Ranchi tour: Journey to a land of waterfalls where legend and history creates an aura.